Security firm AVAST warns six out of every ten avast! users are running outdated versions of Adobe Reader, putting them at risk ton an array of Adobe-targeting malware. AVAST Software researchers have discovered that six out of every ten users of Adobe Reader are running unpatched versions of the program, leaving them vulnerable to a variety of malware attacks. An analysis of avast! 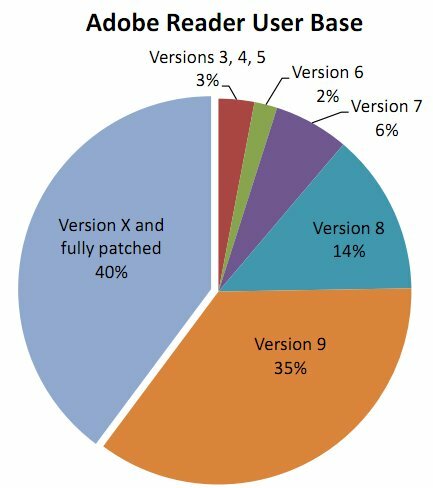 antivirus users found that 60.2% of those with Adobe Reader were running a vulnerable version of the program and only 40% of users had the newest Adobe Reader X or were fully patched. One out of every five users also had an unpatched version of Adobe Reader that was at least two generations old (8.x). Adobe Reader is the most popular PDF reader application and subsequently is the biggest target for malware writers. Over 80% of avast! users run a version of Adobe Reader, with Foxit, the second most popular PDF reader, having a much smaller user share of 4.8%. “There is a basic assumption that people will automatically update or migrate to the newer version of any program. At least with Adobe Reader, this assumption is wrong – and it’s exposing users to a wide range of potential threats,” said Ondrej Vlcek, CTO at AVAST Software. Malware PDF exploit packages will typically look for a variety of security weaknesses in the targeted computer, attacking when an uncovered vulnerability is discovered. “Most exploits have been made to hit all vulnerable versions, not just one,” explained Mr. Vlcek. “Libraries of code are shared between various Adobe versions which also means that vulnerabilities are shared.” Updates are the key security issue as the AVAST Virus Lab did not detect a causal link between specific versions of Adobe Reader and exposure to malware. “It is actually possible to be fully patched and up-to-date if you are running Adobe Reader 8 or 9,” stated Mr. Arkin, “But I think a large percentage of users simply decline the update notification.” Keeping secure, especially for the older versions of Adobe Reader, does require some user attention. People actually still use that bloatware? Foxit is better, faster, and cleaner than Adobe could ever hope to be.